Of the third generation widebodies (assuming the 2nd generation included the 767 and A310) the 777 was the last to appear but has proven the most successful compared to the McDonnell Douglas MD-11 and the Airbus A340. It is hard to believe that it first flew as long ago as June 1994. In several ways it was a groundbreaking design since it was the first truly long range twin engined widebody of its size plus was the first commercial airliner to be designed entirely on computers. It was also famously designed in direct consultation with 8 major airlines - all of whom, except Qantas, would go on to become major customers. The 777's distinguishing features include the largest-diameter turbofan engines of any aircraft, long raked wings, six wheels on each main landing gear, fully circular fuselage cross-section, and a blade-shaped tail cone. Widebody airliners sell well so it is no surprise that the 777 has featured widely in 1:400 scale and continues to see a steady stream of releases even though the series 300 has taken over as the major production variant. Having said that there has not been the same evolution of moulds recently that the 777-300 has had. Nowadays only two of the moulds below are in regular use (the Phoenix and Gemini Jets 2 versions). There have been about 371 releases to date. United Airlines became the launch customer on May 15, 1995 and although only 88 777-200s were built a further 354 777-200ERs, outwardly similar but with significantly enhanced range, were also produced. The base 200ER was further enhanced into the 777-200LR and 777-200F (both with extended wingtips) of which a further 59 and 163 respectively have been ordered or built. Nowadays only the 200F remains in production but the vast majority of aircraft built are still in service. With the advent of more 787s and A350s it is likely that in the near future the number of active passenger variants will decrease quickly. The first 777 mould made in 1:400 appears to have come from Herpa, although as is typical for them in 1:400 they failed to follow up their advantage and the mould has only seen sporadic use since by them and Hogan. This is no great shame as despite it being a seamless mould it isn't impressing me much. The mould overall looks not ok, even if the cockpit to radome transition doesn't look correct, however the undercarriage is awful. It looks like 1:500 scale gear stuck onto a 1:400 scale mould. I'll be honest and say I have never seen one of these in the flesh so maybe I am wrong. Frankly they are so insignificant in this scale that the mould is unlikely to feature in your collection. Dragon's widebody moulds for older types like the 747, Tristar and DC-10 tend to be well thought of whereas their newer widebody types like the A330 are much weaker. Their 777 also fits into this later category. I'm not sure why this pattern is present since the moulds themselves were made around the same time. Even so the 777 isn't totally without merit. As always with Dragon the mould is seamless with great slot in wings. The overall shape is ok but the nose isn't perfect. It is the usual failings that decrease the mould's value - simplistic undercarriage, loosely fitted tails and if they bother you plastic control surfaces. Some of the earliest releases have simple stalk maingear (see right) but later releases (like the JAS and Korean) below are actually quite nice. Gemini's 777 is one of those classic rock solid moulds that used to typify Gemini - in a good way. It has an excellent body shape, superior to the Dragon Wings at both the nose and tail. It also has much better undercarriage, although obviously given its age it is not rolling gear compatible. The gear is also perhaps a tad on the short side. Nonetheless the mould has aged reasonably well as long as the fuselage seam, caused by the cradle mount mould, isn't a problem for you. For secondhand models it shouldn't be but for new releases when there is a competitor it should. Gemini have subsequently modified the landing gear and still use this mould (see the 1b version below) and in competition with the modern Phoenix it doesn't fare well. Interestingly the first few Phoenix 777s used this mould as did a small selection of Schuco rebadges. There was a time when Phoenix did great things and there are few moulds in 1:400 as well liked as their 777s. Given this mould dates all the way back to 2004 and is still the best 200 series you can't help but be impressed. 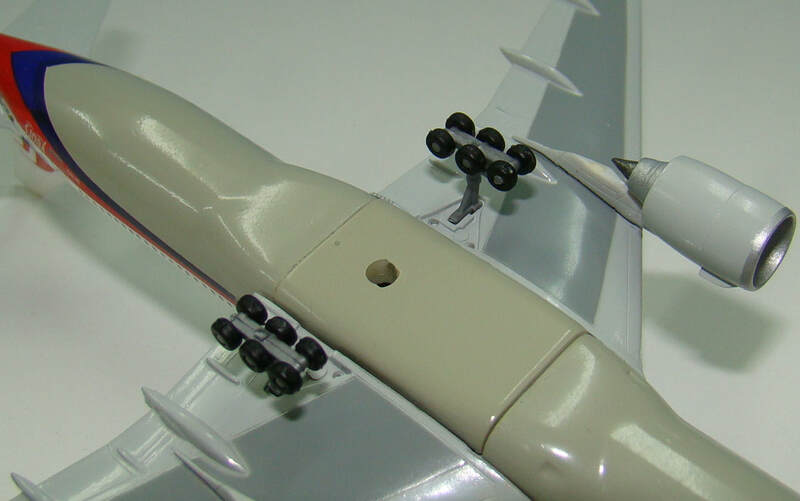 The fuselage and vertical stabiliser are near perfect as are the wings (slot ins not a cradle) and horizontal stabs. The mould has been updated with aerials and satnav domes and they also look good. All four aerials are usually present whilst the small bump just after the wing is in good relief. About the only criticism I can put the mould’s way is that the engine pylons aren’t deep enough under the wings. Perhaps the engines are a little small also but if so these are minor points and at least avoid that perennial issue with so many 1:400 moulds where the engines are far too close to the ground. One of the nicest features about the mould is the undercarriage. Phoenix usually have great gear legs and wheel hubs but on the 777 maingear it also has the nice feature that the triple wheel bogey can be moved up and down to simulate take-off and landing attitudes. The mould exists in 777-200/ER and LR/LRF versions. Note in the photos below the extended wingtips of the cargo haulers. Back before JC Wings tookover production of Gemini Jets and gained access to their moulds they created their own 777-200. It is pretty decent although it never really got a lot of use and struggled against the much loved Phoenix version with which it usually competed. The shape overall is good, however JC seemed to sometimes struggle to print the cockpit well and I'm not sure if this is a mould or just a print issue. It does have nice rolling gear and a slot in wings seamless mid-section, but the maingear seems to sit too low and the engines are quite close to the ground. For some reason JC Wings stopped using this and switched over to the inferior Gemini Jets mould. The decision doesn't really make a lot of sense to me. The old Gemini Jets mould had static landing gear. 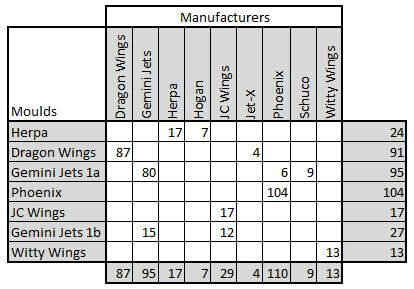 Following the move of Gemini production over to JC Wings several of their older moulds have been updated and in 2015 it was the turn of the 777. Unfortunately they merely replaced the landing gear and added antennae leaving the rest of the mould alone. The new gear rolls but to my eye appears to make the aircraft too tall. This isn't the end of the world but buying a modern widebody mould with such a major seam on it in 2018 seems wrong, especially when the competition has had a seamless mould since 2004. JC Wings have for some reason also switched over to this mould and unlike for the 777-300, where JC Wings have built a completely new mould, they continue to persist with this obsolete version. I mean it's ok but really Gemini. Anyway if you collect US airlines you are rather stuck since Phoenix just don't compete often in that space. Towards the end of their existence Witty Wings were beginning to show signs of good innovation. This 777 mould must have been one of their last new moulds but was a decent effort and featured see through engines - something rarely if ever seen before in 1:400. The mould is seamless and has rolling gears. The engines do seem a little close to the ground but overall it was a good mould that saw far too little usage before Witty and their sub-brand Apollo folded. As of February 2018 JC Wings have announced 6 777-200s two of which are flaps down versions. My understanding is that this will be a new mould and if the new JC Wings 777-300 is anything to go by it ought to be excellent. The 777-200 has been treated quite well in this scale and aside from the two earliest moulds I am happy to feature any in my collection. Even so the usage of a seamed mould for new releases is a shame and the superior Phoenix 777 keeps the throne of currently active series 200 moulds, but the new JC Wings mould offers much promise.